Normally more into futuristic architecture and moody places, this was a nice step out of my comfort zone to create some fresh content. Furthermore, I'm collaborating with Canon Deutschland for a couple of weeks now and they provided me with some solid gear to test out in the field. For the trip to Croatia, my backpack included the Canon 5DS R, a 50.6 Megapixel monster and a couple of Canon L prime and zoom lenses. I've already used this camera in the Alps, as well as for pure architecture work. So I was really stoked to see how this setup performs as a general travel kit. Please note: This is not a test review by any means. I rather share some insights and opinions related to this trip. 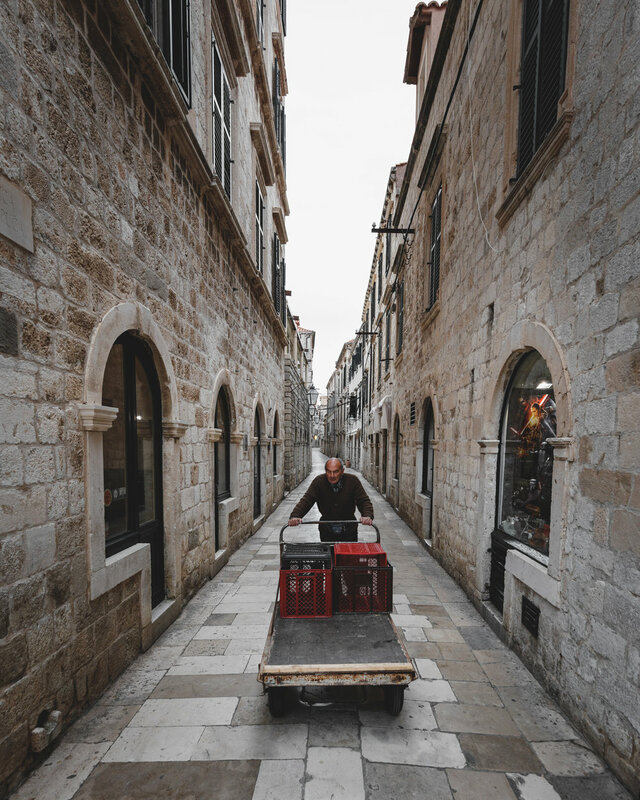 Most of Dubrovnik's old town infrastructure is well-preserved and so it's no surprise that it's an UNESCO World Heritage Site. Whenever you're around, make sure to walk up the Srđ mountain for a very nice view on the city itself. It's also possible to circuit the old town on the city walls by paying an entry fee. This is a very nice opportunity to get some different shots of the unique architecture. I'd recommend to bring some time and a good variety of lenses. Go there in the late afternoon to benefit from the good light. The resolution of details, provided by the 50.6 Megapixel sensor of the Canon 5DS R, is just mind-blowing. Shooting static subjects is one thing though, as it is easily handled by most modern cameras in this price range. But as the 5DS R inherited the class-leading AF system of the 5D Mark 3, I was really excited to see, how it performs in the streets, when shooting fast moving people. The camera operated very well in this regard and as you can see above, Dubrovnik has some pretty cool basketball courts too. One of them is located next to the city wall on a hill and it offers you an amazing view over the whole old town. If you ask me, that's quite a dope spot to have a match, or getting some nice shots. The other two pictures show some residents while preparing their stuff for the day. To get shots like this, you really have to get up early and be in old town shooting, even before the sun rises. Unfortunately, Dubrovnik has become really famous due to some movie sets, which took place in parts of the city. During peak season, you'll have to deal with thousands of tourists, flowing through the streets and alleys. So you better get out there shooting before everybody else does. Dubrovnik is a nice destination for a short getaway. It offers unique and well-preserved architecture, which is definitely worth seeing and taking pictures of. You'll also find some nice little spots to hang out at the beach, having a little rest from the rush of old town. I'd highly recommend to visit this city during low season. That's what I've done and still it was so crowded, that it's hard to imagine how this will be when the season reaches its peak. Regarding the camera, I shoot full-frame for quite a while now. Coming from a mirrorless system, I was overwhelmed of how easy the 5DS R tracked the subjects in challenging light. The whole system feels responsive, is fast to operate and gives me a certain amount of confidence in getting the shot. Something I was not so sure about on my mirrorless, especially in challenging situations. Of course, one has to consider the extra weight and size of this setup, compared to a mirrorless kit. Especially when travelling, this can be a major factor. But for me, reliability of the overall system and quality of the output is more important than saving a couple hundred grams. Also, I have to admit, that the Canon L zooms are strong performers, easily delivering the output of prime lenses. Using these zooms doesn't only reduce the overall size and weight, but also the moments on where I have to swap lenses. Together with the solid AF system, these are the things, which often make you getting the shot or not. The huge resolution of the 5DS R is another plus point on my list, as it allows me to get highly detailed images as well as unseen possibilities to crop images in post. And I can always downsample the shots to save some disk space, if needed. Still, I can't stress enough, that cameras are just tools in the hands of a creative being. In the end, it's the photographer, who has to decide, which tool can live up to his standards. Personally, I need to rely on a limited kit of high quality equipment, which doesn't let me down while travelling. So for my part, I definitely feel blessed to have the opportunity to collaborate with such an amazing brand, which actually believes in my work and vision. I'll take the whole system to Japan by the end of this month. So stay tuned for more content and blog posts.